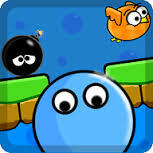 Shanti Runner, is a game where you have to run and jump across many obstacles.It is a simple game but very challenging just tap the screen with your finger.Get as far as you can without being hit by the enemies, use the power-Ups like the shield, magnet, etc to defend yourself.Collect the coins in the game to upgrade the Power-ups and get farthest.Features:-Beat your friends high scores with the integrated leader board-Easy game play-Very addictive-Increasing difficulty from easy to very hard#This app does not have notification ads#Permission Explained:Required for some libraries I’m using ( online score, ads, crash logging)In order to give you a free app and keep developing more free apps in the future, we are integrating a search tool to our application. This will add a few access points to your device (hence the permissions) to direct you to the web search service. Please consider using the search to help us keep creating apps. You may delete the search icon, bookmark and homepage easily. Thank you.